While revisiting World War Z, the movie I picked as the best of the summer (and originally reviewed here), on the newly-released Blu-ray edition, I was a little concerned. Only the standard DVD contains the original theatrical cut, with an “unrated” version being the only option for the Blu-ray. Too many times, these extended cuts add little to (or even hurt) the quality of the original version. One of the criticisms lobbed at Z was that a zombie movie should be a hard R, not PG-13. The thing is, with very strong box office performance worldwide, apparently no one was especially bothered by the relatively lack of blood or gore. The Blu-ray “unrated” version adds about seven minutes to the running time, but I’m happy to report that none of the additions stand out as particularly distracting (at its worst, copious blood is seen spurting from an unconvincing severed limb). I still strongly oppose the elimination of the original version of any movie. Give viewers the choice, at least. But in Z’s case, the additions amount to little more than some additional violent imagery. None of it is necessary, but luckily there aren’t narrative or character-related changes. Usually, extended cuts are little more than marketing ploys. No matter what director Marc Forster has said in interviews, the little bit of extra gore doesn’t add anything at all to the film’s level of intensity. I won’t bother rehashing my previous review of the film as my feelings haven’t changed. I still find the ‘epidemic survival’ storytelling approach refreshing. The story doesn’t focus on a small band of survivors fending off zombie in a small area. Aside from Gerry Lane (Brad Pitt), we don’t see all that much of any other character. The plot keeps surging forward as Gerry hops across the globe, with each stop having its own unique flavor. One of my favorite moments is the detonation of a nuclear bomb, as seen from the cockpit of an airplane. While such an event is often an F/X showcase in most films, here it’s almost offhanded – the least of Gerry’s problems at that moment. The detonation’s wider-reaching implications are left to the viewer to contemplate momentarily, before Gerry’s journey continues. The third act, criticized by some as anti-climactic, offers a boldly down-scaled conclusion that bucks the current trend of going bigger and louder as a movie progresses. 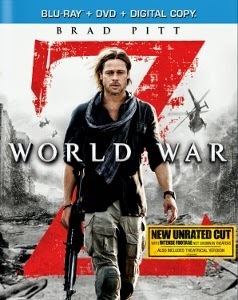 Just as one would expect from a $200 million production, World War Z comes to Blu-ray with excellent audio/visual specs. Most notable about the image is that detail isn’t lost amidst the film’s many darker stretches (see the South Korean sequences in particular). The DTS-HD MA 7.1 mix is loud and proud, with explosions and cacophonous zombie hoards sounding appropriately menacing. There’s plenty of aggressive LFE activity, so much so that even the occasional line of dialogue carries a bit too much resonance. But overall this is an enveloping mix that puts the viewer right in the thick of things. Special features are admittedly a bit disappointing. No commentary, no deleted scenes, and no participation by producer/star Brad Pitt. “Origins” and “Looking to Science” are so-so featurettes, each running about eight minutes. More interesting is the four-part “WWZ: Production,” which walks us through the major set pieces, offering a glimpse of how the effects were achieved. It was especially cool to see how they achieved the transformation of Glasgow into Philadelphia. We hear from various cast members, including leading lady Mireille Enos, along the way.